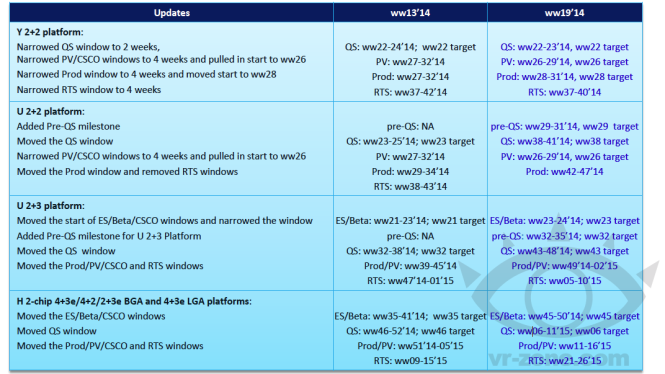 A couple of days back, we informed you about direct word from Intel management about the release schedule of the 14nm ‘tick’ version of Haswell, the Intel Broadwell. Broadwell is to hit the stores in devices this holiday season, but will miss the end of August school opening season, according to Intel CEO Brian Krzanich. Well, we have more news this time. 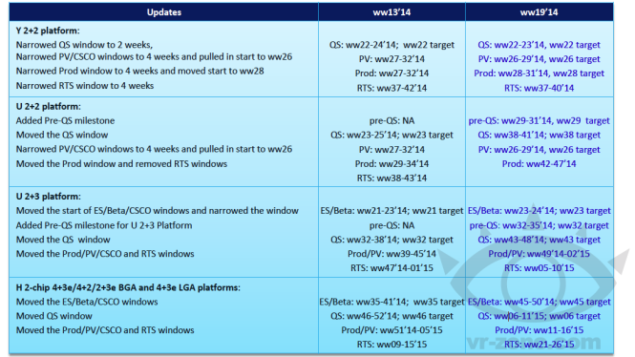 Chinese site VR-Zone now claims to have some additional information about the release schedules of different variants of Intel Broadwell, particularly the BDW-H for home-builders and enthusiasts, featuring the Iris Pro 5200. Intel is clearly focusing towards the mobile processor market with the release of Broadwell this time round. The first Intel Broadwell processors to hit the market will be the BDW-Y variant. This is the fanless processor designed primarily for use in tablets and hybrids. It features 2 cores and GT2 graphics. GT2 covers the Intel HD 4600, 4400 and 4200 range of integrated graphics systems. The BDW-Y is expected to undergo 27 weeks of mass production and be delivered to manufacturers around 37-42 weeks i.e in late September or early October. Next in line, after the Y series, is the BDW-U variant. The U series come in two platforms. These are namely the 2+2 and 2+3 platforms. The regular U series, targeting Ultrabooks are expected to go into production two weeks after the Y-series. They will therefore be available for delivery to manufacturers around 39-44 weeks, which is around the same time for the Y series. They will be followed by the beefed up U 2+3 versions featuring GT3 graphics. These lavish processors are expected to go into production in fall with deliveries to manufacturers expected somewhere in the first week of 2015. Laptops using the U 2+3, including Apple’s Macbooks can be expected somewhere in early February. Now coming towards perhaps the most anticipated variant of Intel Broadwell, the BDW-H. The H series features dual and quad core mobile SKUs. They will feature GT2, GT3 and GT3e graphics system. It also features quad core LGA chips for use in desktops or workstations. These will also feature GT3e or Iris Pro graphics. The target date for the qualification samples of the H-series is week 6 or mid-February of 2015. Delivery to manufacturers is expected around weeks 9-15, making that somewhere in March or April. Launch and availability of the H-series will now be around weeks 21-26 giving a final verdict of expected shipping in May or in June. This means that we have another year long wait before we will finally be able to get our hands on the mouth watering H-variants. The only thing that can be expected now is that there are no more further production delays, and everything goes according to schedule.